Nursing assistants have a wide range of responsibilities encompassing many duties, from pain management and infection control to creating a safe healthcare environment. Personal skills range from sound judgment to maintaining respectful bedside manner. Nursing assistants work under the supervision of a registered nurse (RN) or licensed practical nurse (LPN), usually in a hospital or a long-term care setting. They have to complete a post-secondary training program and go through a certification process. Although you don’t need a degree to be a nursing assistant, relevant degree programs do exist and will both help prepare you for the work and make you more competitive against other entry-level candidates. A nursing assistant’s duties revolve mostly around the basic daily physical care of patients and associated record keeping. You might help patients use the bathroom or take care of other sanitary needs. You might feed patients who cannot feed themselves, turn bed-ridden patients to prevent pressure sores, transport patients, and help ambulatory patients walk. Nursing assistant skills fall into two main categories, technical and interpersonal. The technical skills are more obviously medical and more specific to nursing. Interpersonal skills, in contrast, are hardly unique to nurses but are critically important to their work. You will not be a doctor, but you do have to understand biological and physiological issues, including common disorders and diseases. You need to understand infectious diseases and how to prevent the spread of infection. You need to understand what’s going on with your patients, and if somebody suddenly presents with dangerous symptoms, you need to notice so you can get help. Nursing assistants will usually observe and record vital signs, including respiration, body temperature, pulse, and blood pressure. You should also know how to change dressings properly and maintain patient safety and personal hygiene. Empathy and compassion are seldom thought of as skills, but you can practice and develop them. You cannot be an effective nursing assistant if you do not care about your patients as human beings. Experiencing empathy and expressing compassion will make for a happier career as a nursing assistant, and will make you overall much better at your job. If you have an innately hard time embodying these qualities, the role of a nursing assistant might not be for you. Medical facilities can become chaotic if staff are not careful. 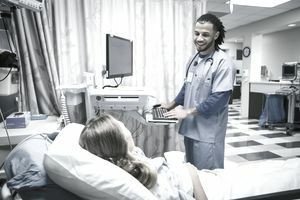 Patient needs can become backlogged and an entire facility can run on a time deficit, raising everyone's workload, if time isn't managed and tasks aren't well organized. You will be responsible for keeping yourself on track, and you may also be responsible for keeping colleagues and bosses in line with organization practices and on schedule. Not only must you do all your patient care techniques correctly every time, but if a patient’s health goes in the wrong direction, you should notice. Even small changes in a patient can indicate a problem, like a change in pupil dilation, breath odor, or personal habit, for example. You should be comfortable with and aware of the small details. Not only must you document everything thoroughly, clearly, and correctly, you should also be just as strong in your verbal communications. Interactions with doctors, other medical and nursing staff, patients, and their families will certainly be an integral part of any nursing assistant job. Remember to clearly name your relevant skills in your cover letter and resume. You can use this list to remind yourself of what to mention, though you should always read job descriptions carefully, too. Employers vary in their priorities, even within a single field. You can use the same process to plan your interview. Focus on the skills you know your prospective employer really wants, and plan to give a concrete example of a specific time you embodied each. It may also help to review our lists of skills listed by job and types of skill.